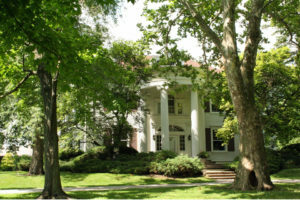 Did you know that Darien has a “White House”? Castle Eden (now the Carmelite Spiritual Center, formerly Aylesford) was built in 1903 as a 1/10th scale model of the U.S. White House on the former childhood home (North Frontage and Bailey Roads) of Josephine Smart Madden. Josephine was the daughter of Elisha and Eliza Smart who were early settlers of Cass. Martin B. Madden named the home Castle Eden after one of his favorite childhood places in England. It is said that Madden commissioned the house to be built as a 25th anniversary present for his wife. Although the land and the building remained part of the Madden estate until 1952, Castle Edenunderwent changes. During the 1930s, the Thayer family of Hinsdale rented Castle Eden and opened it as a restaurant. John Petermann, Madden’s caretaker for Castle Eden, continued to operate the property’s farm. In 1942, Louis Petermann and his family moved into Castle Eden, residing there until 1950. In 1959, the Carmelites purchased the vacant building, the large carriage house, and ten acres for $65,000 as part of the Aylesford Retreat Center of the Carmelite Fathers. [“Historic Home Aging” by Jennie Korb, Suburban Life, May 7, 2002 p. 14-15]. The Carmelites have maintained the home’s original features including the Panama Room which was built to look like the East Room of the White House. The room’s nickname reflects Representative Madden’s backing of the Panama Canal project. The dining room is modeled after the the Oval Office, and the building still has a lovely curved staircase and stained glass windows. Some oak trees on the property are over 400 years old, and the grounds have trees that were given to Martin B. Madden as gifts.